Vegetable Board Where You Can Cut. Move away your Vegetables Safely Using The Pivoted. Two Way Chopping Blade And Then Wash Them In A Hygienic Way. Safe, high quality plastic board. Double-sided Stainless steel blade, with different shaped edges. Super-smooth 360 degrees rotatable handle for easy cutting. 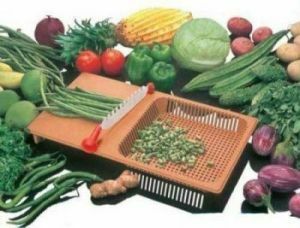 Easily chop and shred all kinds of fruits/vegetable.